I’m back from a month in Amsterdam and catching up on real life. 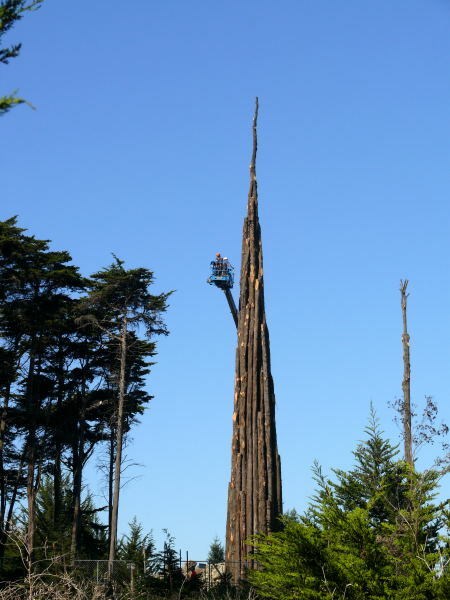 And oh, first thing I discovered that I’d picked a bad time to leave San Francisco because as I was leaving Andy Goldsworthy was arriving to construct The Spire out in the Presidio. And the day after I returned, I learned that it had been erected the previous day. Grrrrrr. So just like his Stone River down on the Stanford campus, I learned about it too late to sneak over and watch him work. Oh well, I met Sybil at the Galleria this morning and had planned to just ride on over to the site on the Segway and hope that the NiMH batteries would be strong enough to get me back home. Iffy, owing to a lot of elevation change, but luckily I forgot my camera and had to return to the house from the Galleria. tape bordering a woodland trail from the parking lot until the tape ended. I then set out cross country through the forest, The Spire intermittently in view through the trees. Not an appropriate endeavor in the first place for a man with walking issues and who only a few days ago had cautioned an old friend to be careful on his excursions into the wilderness. Alas, so intent was I on The Spire that I failed to notice that branches of a fallen tree covered first with vines and then with autumn leaves were concealing a pit, into which I plunged. Luckily, there were no punji sticks at the bottom. Unluckily, the above-mentioned vines were of a thorny disposition, the thorns both numerous and very sharp. They were also readily detachable…from the vines, less so from my flesh. Somehow, the damn things were so intelligently designed that large numbers of them went right through my clothing and then remained stuck in me when I tried to brush them off, so I had to stumble back to the car and then drive back home, where I wriggled out of my clothes and scrubbed myself vigorously in a hot shower until I got the thorns out. Most of them, anyhow. Tomorrow I’m going to ride over there on the Segway and see if I can find a back trail that’ll get me to a point from which better pics might be taken from the safety of the Segway, perhaps even a shot of an annoyed Andy chasing me away.